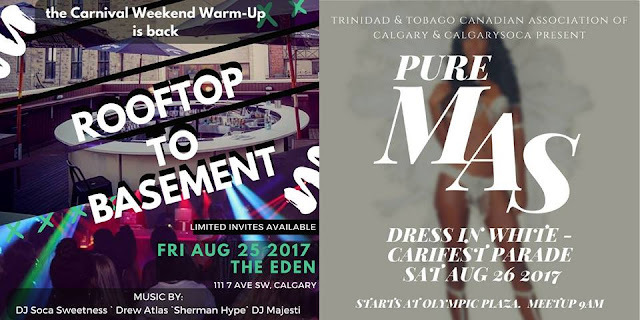 CalgarySoca continues our Carifest warm-up tradition with the return of the 'Rooftop to Basement' Caribbean party at the Eden nightclub on Friday Aug 25th! This year we team up with the Trinidad and Tobago Canadian association of Calgary on the road to play Mas as well! FREE Registration for your place in 'Pure Mas - Parade in white' begins Friday Aug 11 at 9:00am. (We need to know numbers for refreshements) Remember to come DRESSED IN WHITE for the parade. Feters also get a FREE ticket to the warm up fete "Rooftop to Basement" at the Eden nightclub on Aug 25th! https://feteandmas.eventbrite.ca/ for tickets and full event details.